I’m participating in the 3rd Annual Knitting and Crochet Blog Week. Today is all about color. I love warm colors. I love cool colors. I’m attracted to anything that inspires a strong positive emotion (pumpkin orange, you and I are the best of friends). I’ll even admit to a grudging appreciation for those colors that incite a strong negative response (Chartreuse, we’re going to have to agree to disagree). A quick snapshot of my Ravelry favorites folder reveals project after project in calm, neutral hues. I’m shocked. There are a few items in bright, punchy colors, but for the most part, my favorites folder is graysville USA. 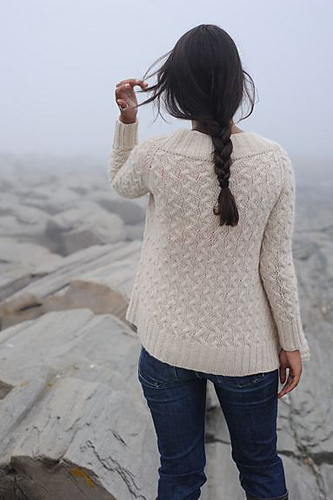 Hannah Fettig's Rocky Coast cardigan. Pretty pattern but very bland. Gemini T. Again, lovely details. But it's gray. Line Break by the invincible Veera. A snapshot of my projects folder–the stuff I’ve actually knitted–tells a different story. I have shawls in vivid grass green and deep rhubarb pink. A yellow cardigan that glows like a candle. Cowls in golden plum, heathered green and pumpkin orange. How on earth does this jive with the contents of my favorites folder? Each and every one of these patterns lived in that folder for at least a little while. What gives? The answer lies in an analysis of the patterns of origin for each of these knitted projects. 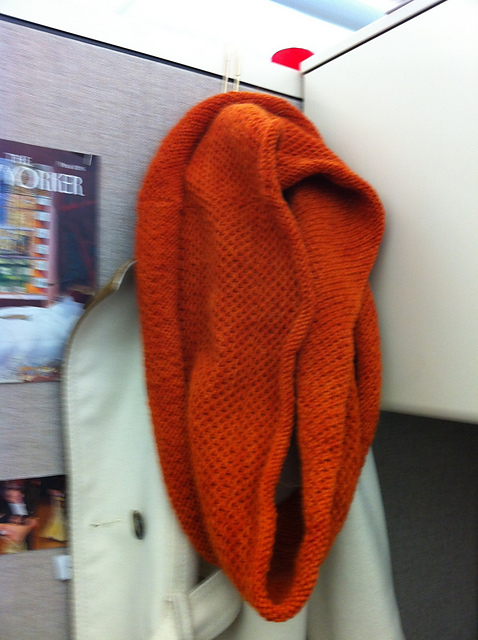 A cowl pattern that started out in a cool minty green was knitted in vibrant pumpkin. A shawl originally designed earth toned autumn colors is twice transformed in colors straight out of the produce department. There is only one project that I actually knitted in the same color shown in the pattern (the yellow cardigan). I’m a juicer. I can’t help juicing things up. I see a pattern and immediately imagine how much more awesome it would be in another color. I can’t leave well enough alone. There’s no such thing. Previous Knock my socks off, will you? I adore all three of those colours. I was trying to pick out a favourite but I just can’t. If I was a designer I would probably photograph garments in neutral colours. I think you give people a lot more scope to work with because you can easily apply a colour on top. I think it’s a little easier to imagine a cream top in pink rather than a pink top in yellow. But then again I see colours differently to everyone else so what do I know. I assume you’re referring to the white, gray and grayish purple. 🙂 You know, I really like those colors too. I just know that, when it finally came down to choosing yarn, I’ll choose something more saturated. It’s my programming. 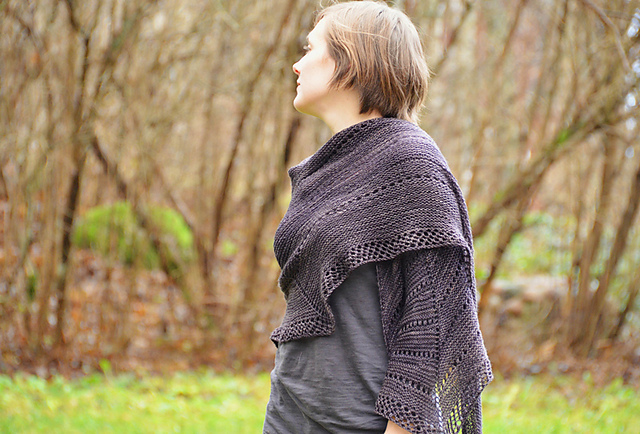 Another factor in this whole thing is that I’m a process knitter. I knit because I love the process; the finished product is secondary pleasure. So it makes sense that I gravitate toward yarn that is fun for me to knit with, even if the finished product is in a color that may be a bit hard to wear. I think you are correct that it’s a good strategy for a designer to do sample garments in neutral colors, especially if what you want to show off is the awesomeness or your design. Bright colors are really attractive and will grab eyes like nothing else, but they tend to distract from the finer details, IMO. At least when you’re trying to get people to appreciate your pattern and not the yarn you chose. Your ruminations have given me a little insight into my own colour choices in knitting. I find that I will buy brightly coloured yarn, and I love working with it, but am unlikely to wear the end product unless it’s in a neutral colour… LOL. My wardrobe is pretty much black, red, grey and a little white. Now when I buy yarn I make it a habit to ask myself if I will wear something made out it, and then ask myself again before I knit a pattern if I will wear it in that style and colour. It stops me being wasteful and putting a lot of effort into something I won’t wear, but it makes for blandness. I know what you mean. In the future, I think I’m going to have to adopt some of your attitude when it comes to knitting for myself. That is, if I want to create versatile pieces for my wardrobe. Witness the gray cardigan I wore to work today. Sigh. As much as I may admire bright wool, I just don’t wear brights. And I’m just not going to spend money on yarn that doesn’t feel amazing and fit with my (dull and boring) clothing palette. And brown, don’t forget brown. I hope you don’t end up frogging that cardigan you were showing me this weekend. It’s so pretty.